I have been really excited to do my first official French dip review. I asked my Facebook friends if they had any recommendations of where to start my quest and Spencer Chan suggested that I try the dip at Maggie Bluff's in the Magnolia area of Seattle. 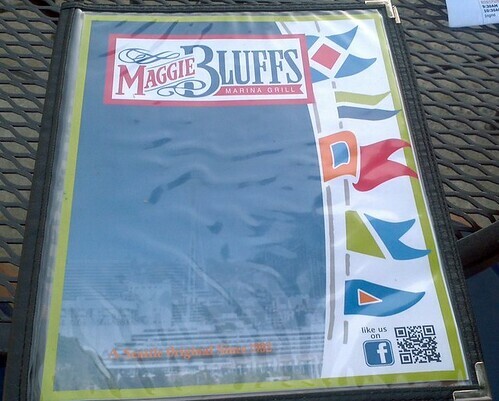 I'd been to Maggie's one time before and remember having enjoyed the experience. Here's my review of the dip there. Jessica and I showed up at dinnertime on a sunny summer Saturday night. 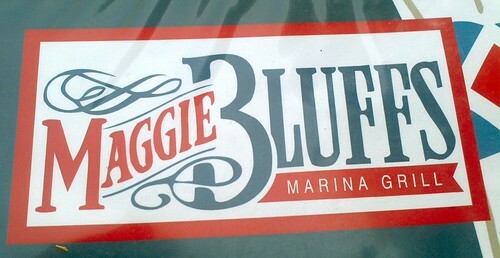 It was a beautiful, warm evening and Maggie Bluff's (MB's from now on) was pretty busy..but the wait wasn’t long at all. We were seated immediately. Many people were out on the patio enjoying food, drinks, and conversation in the sun, looking out onto Elliott Bay Marina and beyond it, Elliott Bay, Mt. Rainier, and the Seattle skyline. The menu was well laid out. There were a lot of other things that looked good as well. Jessica got the chipotle steak tacos. I got the French dip of course, which included by default Swiss cheese and grilled onions. In general, I don’t prefer getting the cheese and onions, as I find them superfluous, but I got them for the purposes of consistency. (See the rating system page.) The bread was from local bakery, Macrina Bakery. The food was quick to arrive and looked very good on presentation. I was stoked to get the tots but torn having to choose between those and garlic fries. They used a quite and nice bamboo twisty on each roll. The bread was very good and pillowy in texture but not too soft. It soaked up the juice nicely and was delicious in general. Served in a nice white ramekin. An insufficient amount arrived initially but it was the right temperature and very tasty so I dove in. When I had depleted my first helping, I asked for more, which promptly arrived and was equally good. The meat was good. Standard roast beef it appeared that was tasty enough. The swiss cheese was good and added some flavor. The grilled onions were not too many. I did not notice the onions much except for one bite when it crunched a bit…I kind of liked that. The portion was very good. There was enough of everything. Overall I would say it was a rather large portion. Overall, the dip was great. The tots were hot and crunchy. The dip, great. 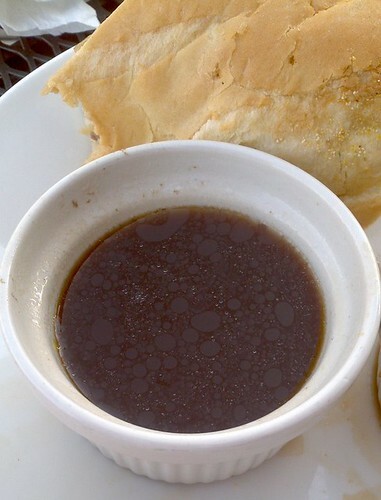 The au jus, as you can see, had a little bit of fat in it (but not too much), which makes for tastiness! I decided that I want to buy a standard poodle. This doggie was roaming around with its owners and it was so cute. 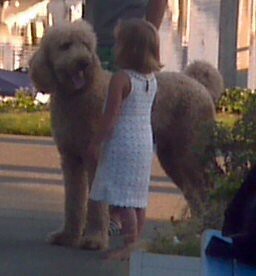 Jessica, who’s a vet, also thought I may be interested in a Labradoodle or Goldendoodle. 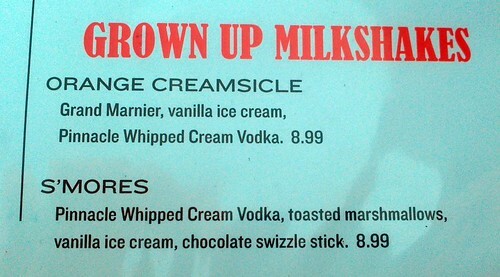 They serve “Grown Up Milkshakes”, which we didn’t order but we will next time for sure! We had a very good dining experience here and the French dip was quite good. 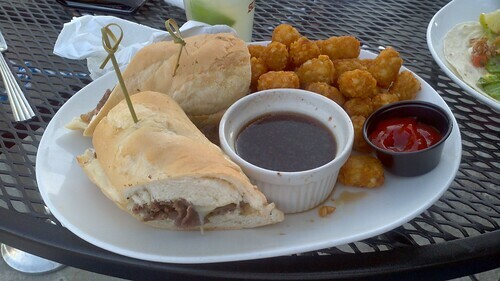 The au jus was very good, the bread very good, the meat, nothing to write home about, and the toppings were fine. The options of sides was a real winner. Real good. From a local bakery. Great dining experience, setting, dip and options. 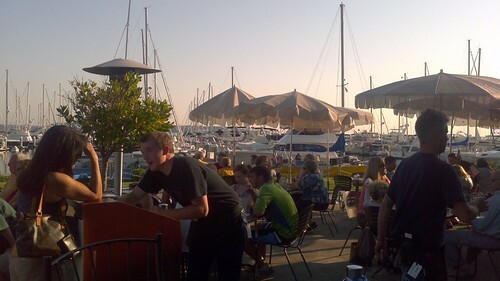 Reason to go back: the location, view, tots, and good, fresh-tasting french dip. My favorite place to spend Seafair Hydro Sunday whenever I can - you get a full view of the Seattle skyline and the full Blue Angels flight path. Love that place; great food (their beer-batter deep fried stuff is yummy) and close to my childhood home which is always fun. Thanks for the info on MB's. I will certainly put their French Dip on my must do list. Sounds tasty! Great review! Thanks for the strait forward approach to your review.